The 14 species of snakes in Massachusetts don’t get enough love and appreciation. So, in honor of World Snake Day on July 16, we thought we’d share just a few reasons that we should celebrate their presence. 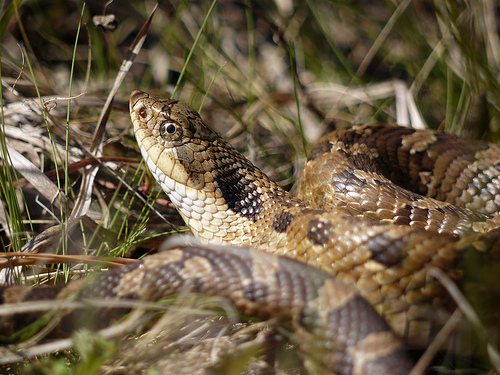 Consider yourself lucky if you have DeKay’s brownsnakes in your yard. These small, shy creatures eat slugs and snails. Other species help keep populations of mice and other small mammals in check. Northern water snakes will even eat leeches in ponds. In Massachusetts, you’ll find snakes with scales in a rainbow of hues, from grass green to bright red to jet black. Ringneck snakes are some of our most stunning, with bright orange-yellow “collars” and underbellies. Eastern worm snakes are tiny and smooth, and look much like earthworms. In fact, earthworms are their main prey, and they spend most of their time burrowing underground. Eastern hognose snakes are harmless, but they put on an incredible display when startled: their necks flare out so that they look like cobras, and if that fails, they’ll roll over and play dead. Three of our snakes are on the state’s endangered species list, and one is listed as threatened. Poaching and habitat loss are two serious threats. If we appreciate and respect snakes, we can keep these helpful creatures around. To read about all of these species of snakes and more, visit the Snake section on our website. This entry was posted in Nature Notes and tagged snakes on July 16, 2014 by Rosemary.